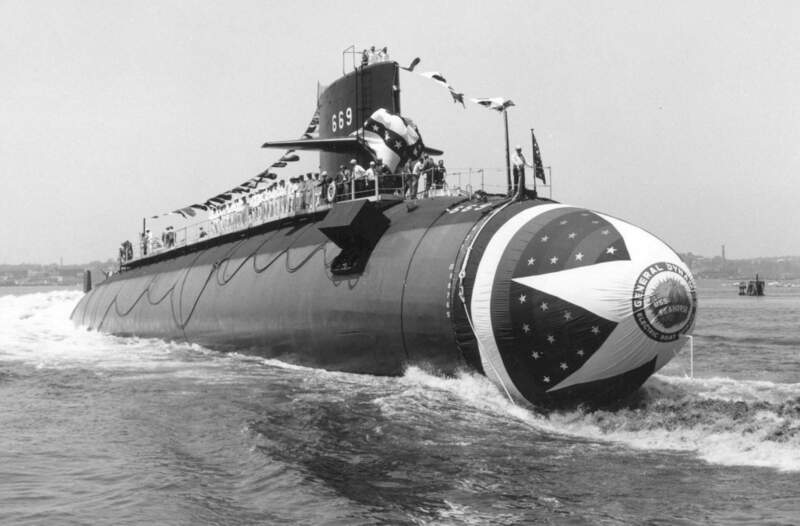 Sturgeon Class Attack Submarine: Laid down, 13 August 1966, at the Electric Boat Division of General Dynamics Corp., Groton, CT.; Launched, 15 June 1968; Commissioned, USS Seahorse (SSN-669), 19 September 1969; Decommissioned and simultaneously struck from the Naval Register, 17 August 1995; Final Disposition, entered the NPSSRP (Nuclear Powered Ship and Submarine Recycling Program) at Puget Sound Naval Shipyard, Bremerton, WA., 1 March 1995, completed program, 30 September 1996. 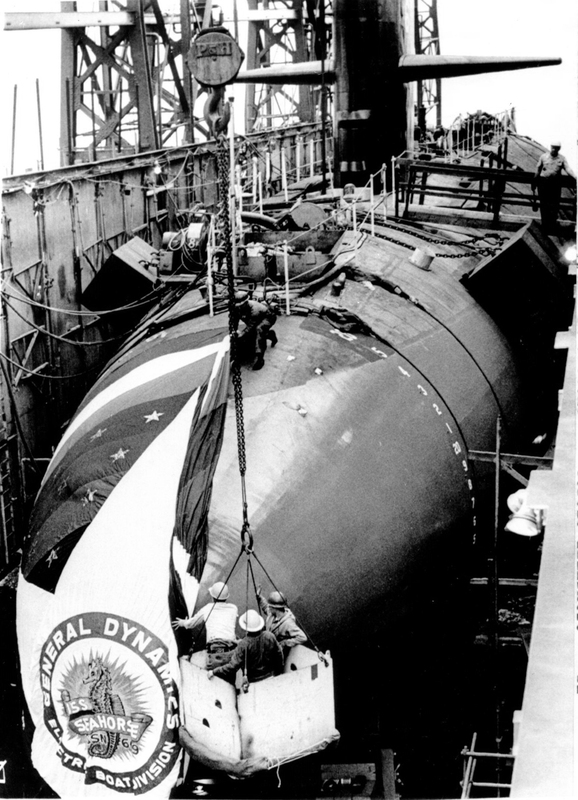 1.96k Seahorse (SSN-669) getting her bow flag in preparation for her launching. UPI photo courtesy of Dale Hargrave. 219k Seahorse (SSN-669), sliding down the ways at the Electric Boat Division of General Dynamics Corp., Groton, CT., 15 June 1968. Courtesy of John Hummel, USN (Retired). 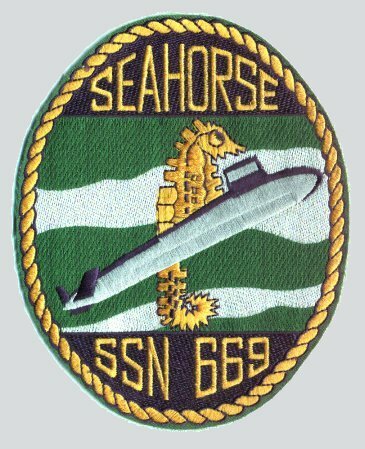 166k Seahorse (SSN-669) afloat for the first time. USN photo courtesy of Dale Hargrave. 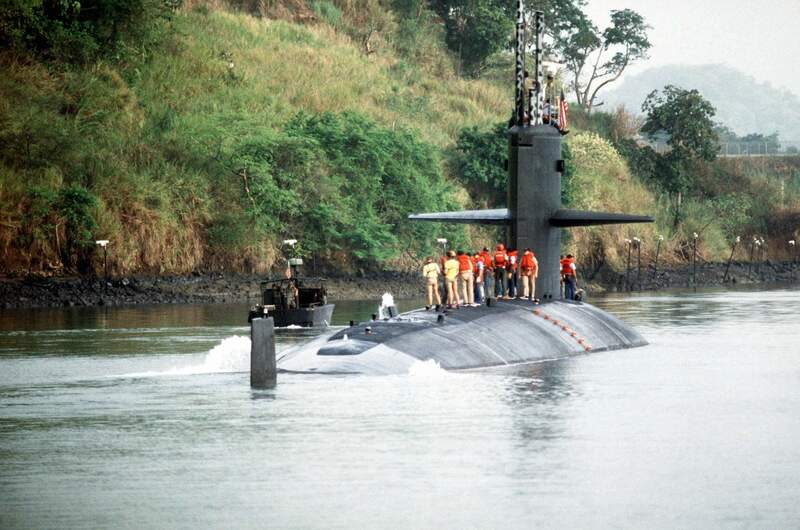 127k Seahorse (SSN-669) being towed to dock after launching. USN photo # NPC 1133392 courtesy of Scott Koen & ussnewyork.com. 310k Seahorse (SSN-669) on sea trials,7 August 1969. USN photo # NPC 1130985 courtesy of Scott Koen & ussnewyork.com. 259k Seahorse (SSN-669) on sea trials,7 August 1969. USN photo # NPC 1140984 courtesy of Scott Koen & ussnewyork.com. 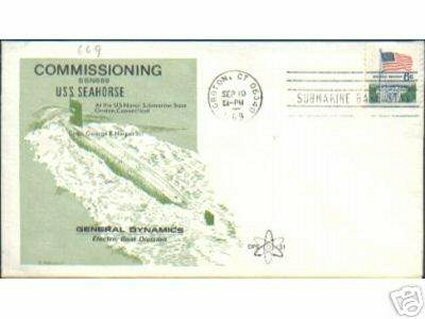 23k Commemorative post mark on the occasion of Seahorse's (SSN-669) first day in commission, 19 September 1969. Courtesy of Jack Treutle (of blessed memory). 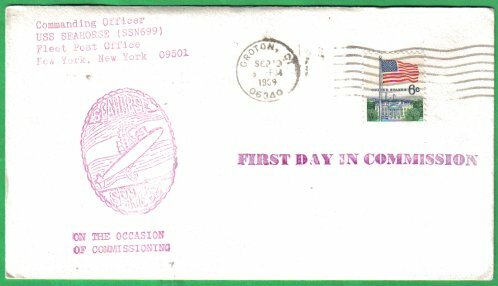 22k Commemorative post mark on the occasion of Seahorse's (SSN-669) first day in commission, 19 September 1969. Courtesy of Jack Treutle (of blessed memory). 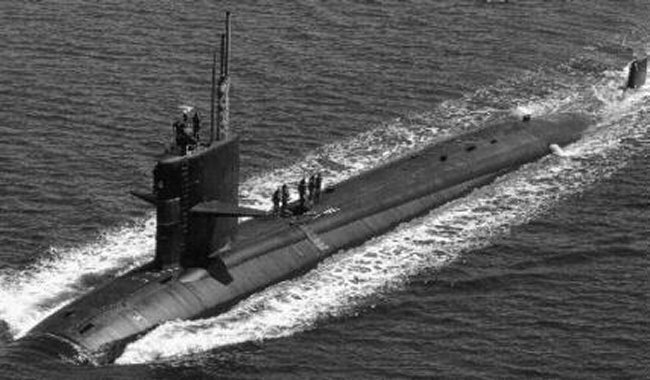 47k Starboard view of the Seahorse (SSN-669), possibly in St. Croix sometime after commissioning, circa 1970. Photo courtesy of Joe Kubenka, courtesy of ussseahorse.org. 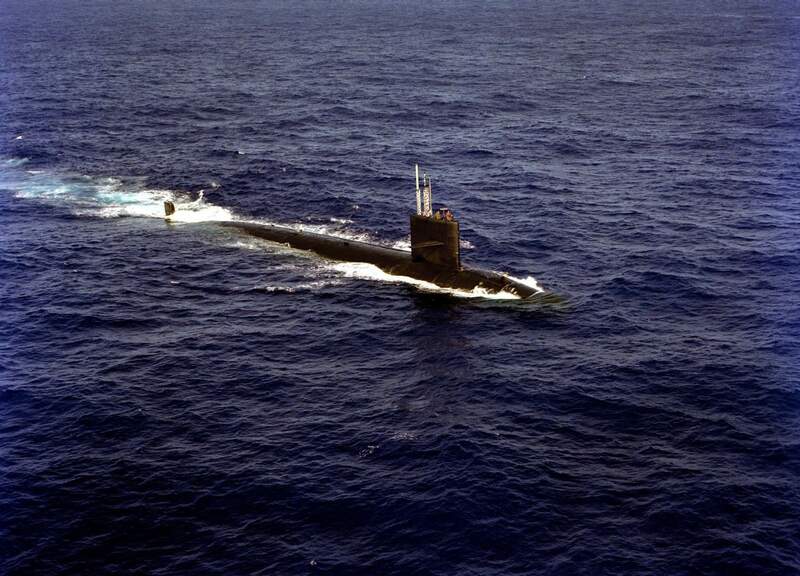 55k Starboard view of the Seahorse (SSN-669), underway in 1985, location unknown. 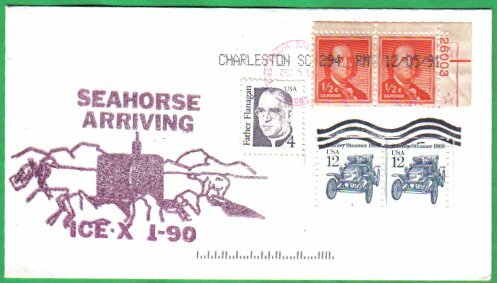 Courtesy of ussseahorse.org. 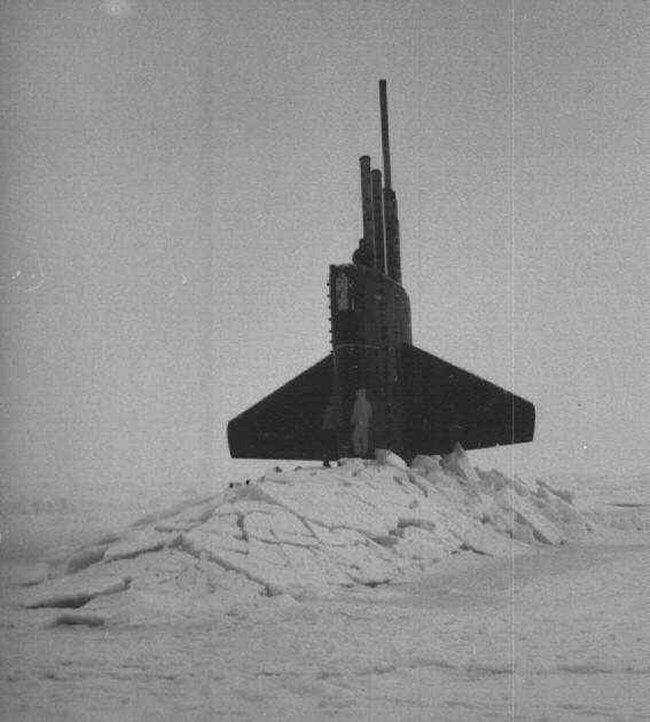 32k Sail of the Seahorse (SSN-669), protruding through the Arctic ice, July 1986. Photo courtesy of Jack Treutle (of blessed memory). 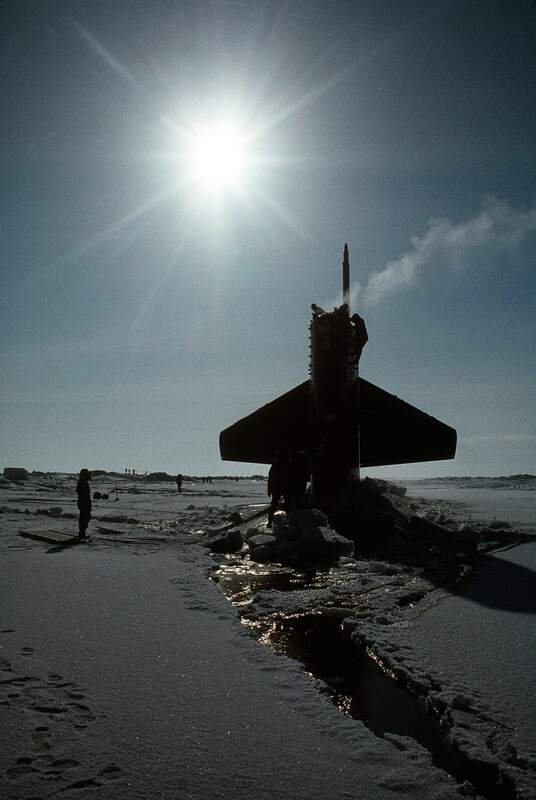 50k The Seahorse (SSN-669), with ice floes through the Arctic ice, July 1986. Photo courtesy of Jack Treutle (of blessed memory). 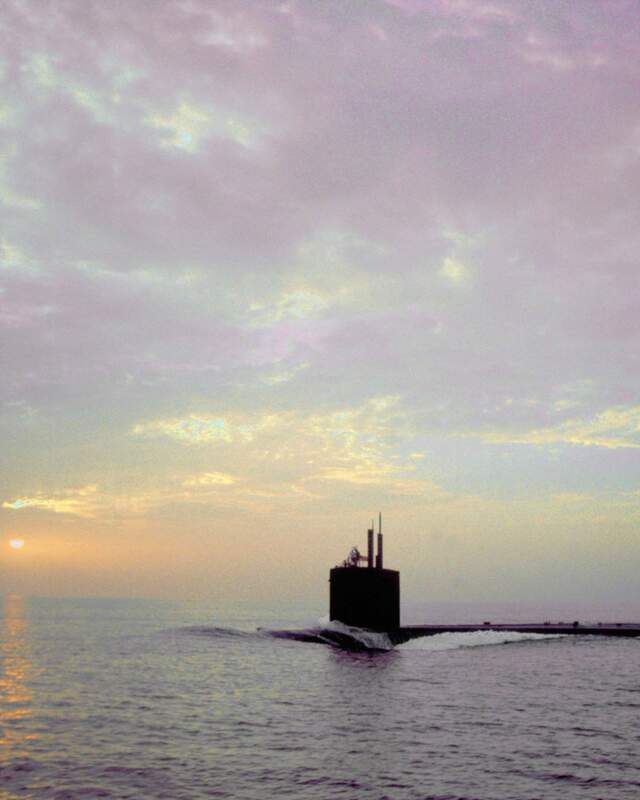 166k A port beam view of the nuclear-powered attack submarine Seahorse (SSN-669) at sunrise, headed for the Panama Canal, 20 May 1989. Official USN photo # DN-ST-89-10061 by PH2 Mark S. Kettenhofen, from the Department of Defense Still Media Collection, courtesy of dodmedia.osd.mil. 383k A PBR Mark 2 riverine patrol boat from Special Boat Unit 26 (SBU-26) accompanies the nuclear-powered attack submarine Seahorse (SSN-669) into the Miraflores locks, 20 May 1989. Official USN photo # DN-ST-89-10059 by PH2 Mark S. Kettenhofen, from the Department of Defense Still Media Collection, courtesy of dodmedia.osd.mil. 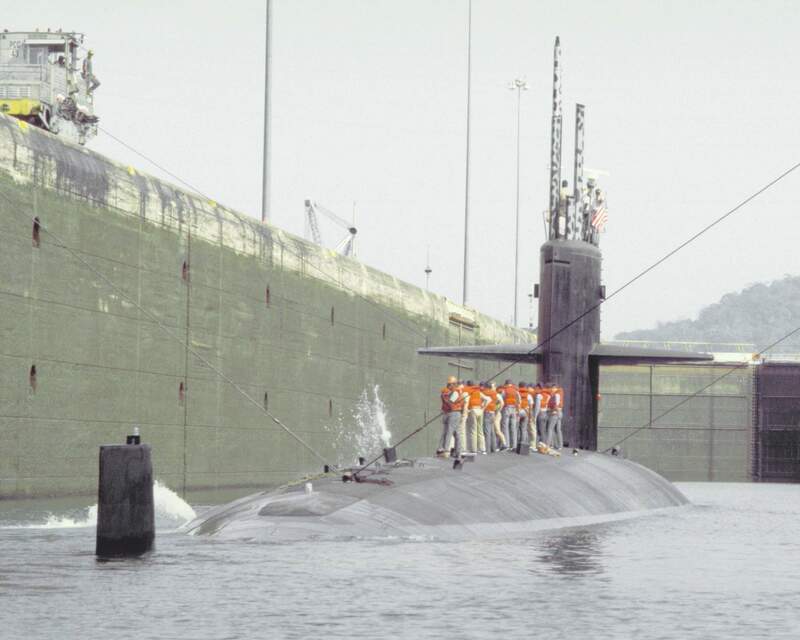 307k Officers and crew stand on the deck and sail of the nuclear powered attack submarine Seahorse (SSN-669) as the boat waits in a canal lock. 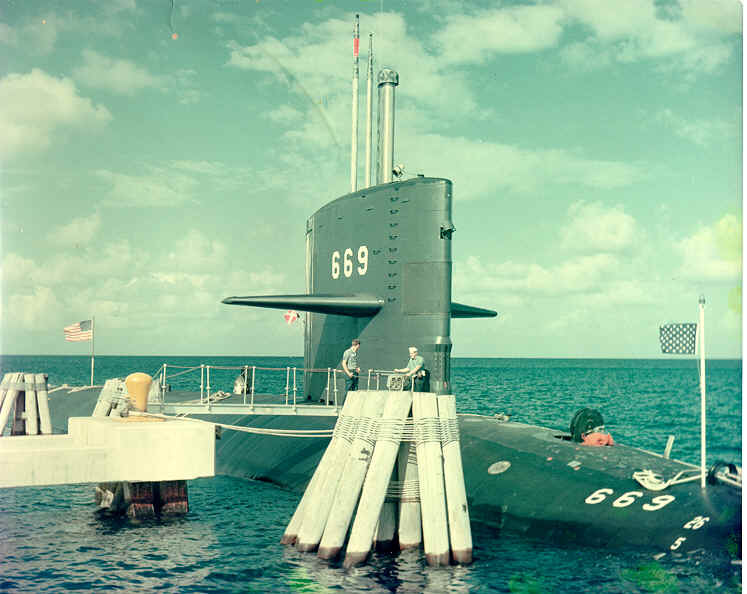 Official USN photo # DN-ST-89-10068 by PH2 Mark S. Kettenhofen, from the Department of Defense Still Media Collection, courtesy of dodmedia.osd.mil. 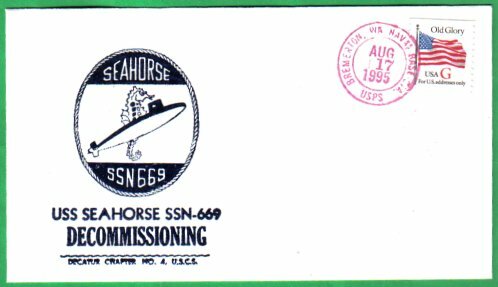 33k Commemorative post mark on the occasion of Seahorse (SSN-669) participation in Ice Ex '90. Courtesy of Jack Treutle (of blessed memory). 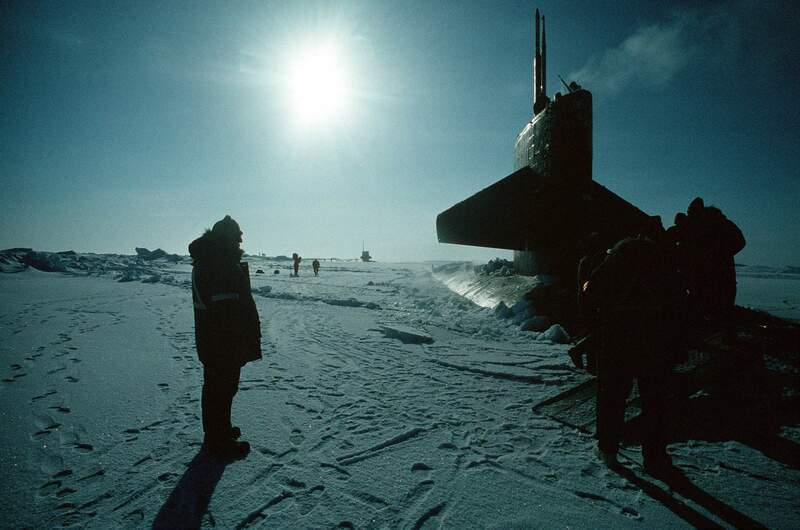 171k Naval personnel stand on the deck of the nuclear-powered submarines Seahorse (SSN-669), during operations in the Arctic ice off of Alaska. Official USN photo # DN-ST-90-07309 by PH1 Harry Gerwien, from the Department of Defense Still Media Collection, courtesy of dodmedia.osd.mil.& submitted by Bill Gonyo. 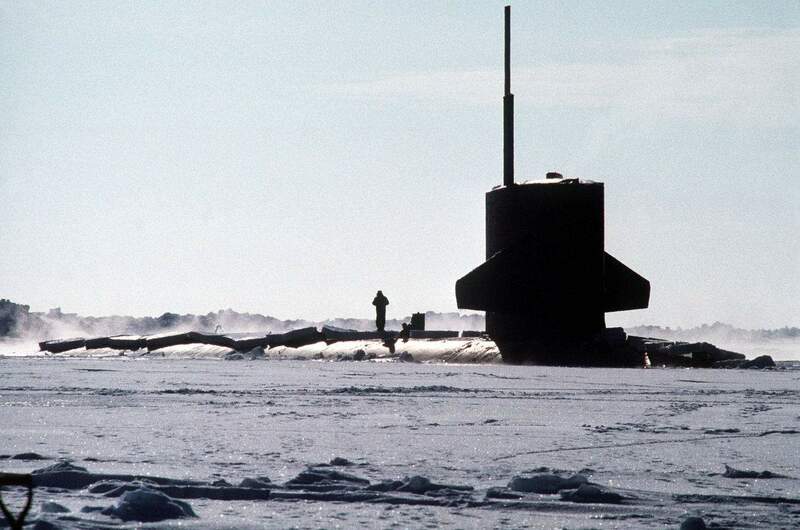 441k Naval personnel stand by the sail structure of the nuclear-powered submarine Seahorse (SSN-669), which has broken through the Arctic ice off of Alaska, 24 March 1990. Official USN photo # DN-ST-90-07303 by PH1 Harry Gerwien, from the Department of Defense Still Media Collection, courtesy of dodmedia.osd.mil. 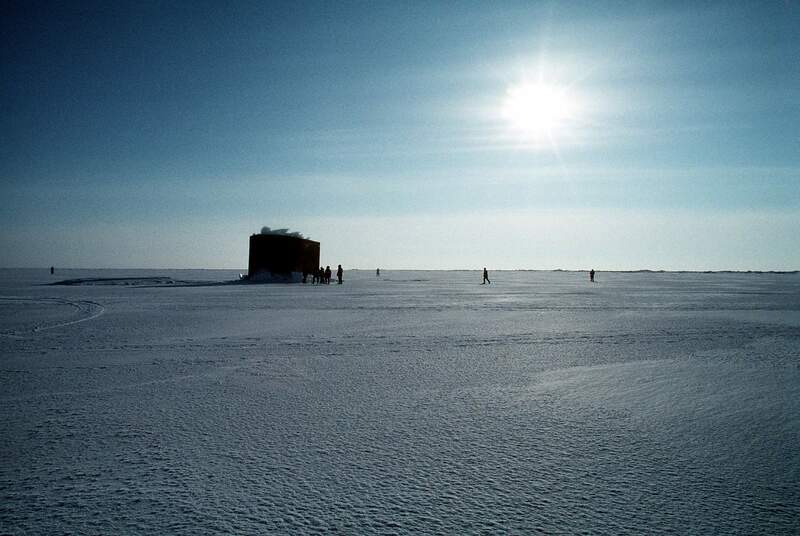 479k Crew members emerge from the nuclear-powered submarine Seahorse (SSN-669) shortly after the vessel surfaced at the North Pole during exercise Ice Ex '90. Official USN photo # DN-ST-90-08030, by PH1 Harry Gerwien, from the Department of Defense Still Media Collection, courtesy of dodmedia.osd.mil. & submitted by Bill Gonyo. 346k Crew members stand on the bow of the nuclear-powered attack submarine Gurnard (SSN-662), background, as others gather nearby to watch the nuclear-powered attack submarine Seahorse (SSN-669) surface through the ice during exercise Ice Ex '90, 25 March 1990. Official USN photo # DN-ST-90-08033 by PH1 Harry Gerwien, from the Department of Defense Still Media Collection, courtesy of dodmedia.osd.mil. 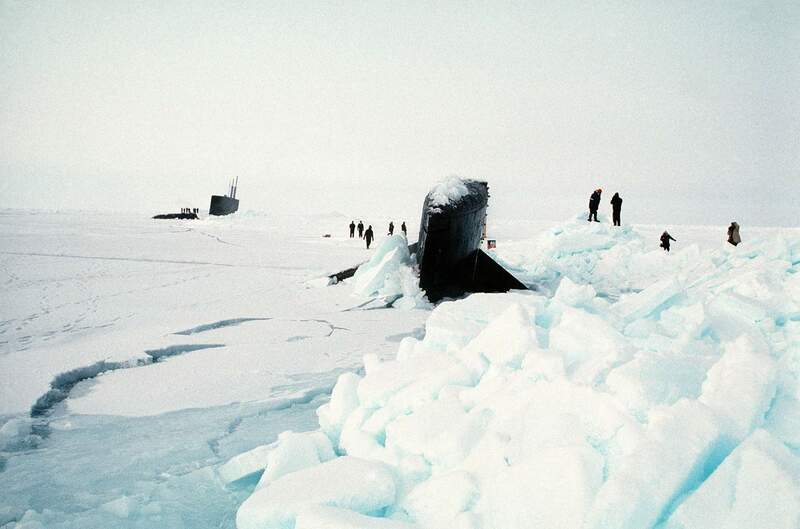 480k Crew members emerge from the nuclear-powered attack submarine Seahorse (SSN-669) shortly after the vessel surfaced through the ice at the North Pole during exercise Ice Ex '90. The sail of the nuclear-powered attack submarine Gurnard (SSN-662), which also just surfaced, can be seen on the horizon. Official USN photo # DN-ST-90-08032 by PH1 Harry Gerwien, from the Department of Defense Still Media Collection, courtesy of dodmedia.osd.mil. 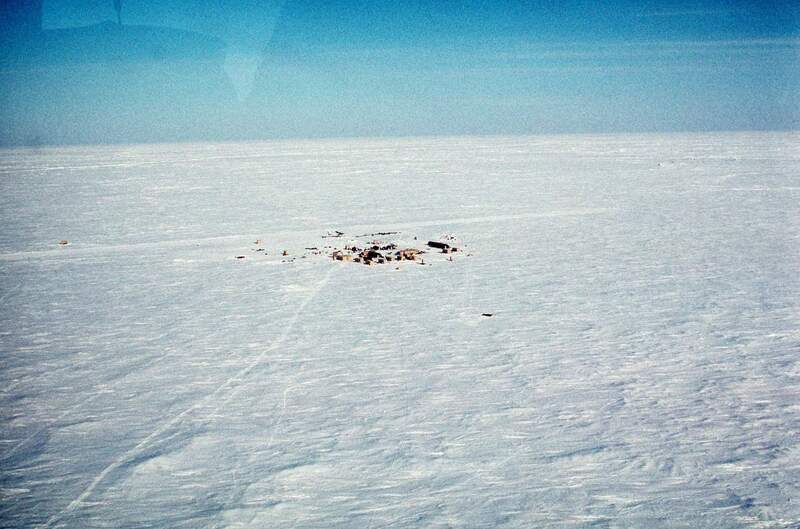 563k The camp, used as a support base for under-ice operations of the nuclear-powered submarines Gurnard (SSN-662) and Seahorse (SSN-669), is dwarfed by the snow and icebound seascape. Official USN photo # DN-ST-90-07317 by PH1 Harry Gerwien, from the Department of Defense Still Media Collection, courtesy of dodmedia.osd.mil. 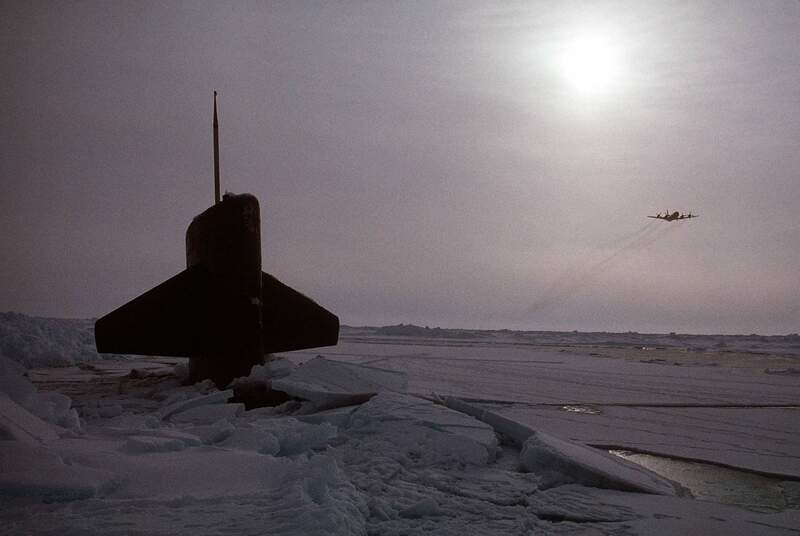 323k With a P-3 Orion aircraft patrolling overhead, the nuclear-powered submarine Seahorse (SSN-669) surfaces through the Arctic ice off of Alaska, 31 March 1990. Official USN photo # DN-ST-90-07300 by PH1 Harry Gerwien, from the Department of Defense Still Media Collection, courtesy of dodmedia.osd.mil. 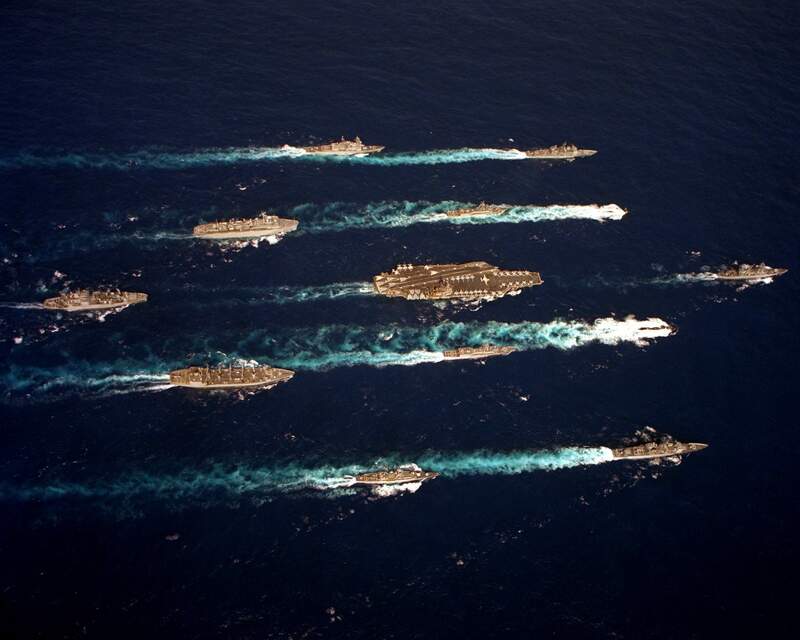 384k An overhead view of the aircraft carrier John F. Kennedy (CV-67) battle group underway en route to the Mediterranean Sea on 16 October 1992. The other ships in the group are: the nuclear-powered attack submarines Albuquerque (SSN-706) and Seahorse (SSN-669); the guided missile cruisers Gettysburg (CG-64), Leyte Gulf (CG-55) and Wainwright (CG-28); the destroyer Caron (DD-970); the frigates Capodanno (FF-1093), Halyburton (FFG-40) and Mcinerney (FFG-8); the destroyer tender Puget Sound (AD-38); the ammunition ship Santa Barbara (AE-28); and the replenishment oiler Kalamazoo (AOR-6). Official USN photo # DN-SC-93-00851 by CWO2 Kenneth H. Brewer, from the Department of Defense Still Media Collection, courtesy of dodmedia.osd.mil. 313k A starboard bow view of the nuclear-powered attack submarine Seahorse (SSN-669) underway. 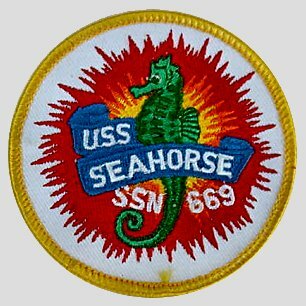 The Seahorse is en route to the Mediterranean Sea as part of the aircraft carrier John F. Kennedy (CV-67) battle group. Official USN photo # DN-SC-93-00865 by CWO2 Kenneth H. Brewer, from the Department of Defense Still Media Collection, courtesy of dodmedia.osd.mil. 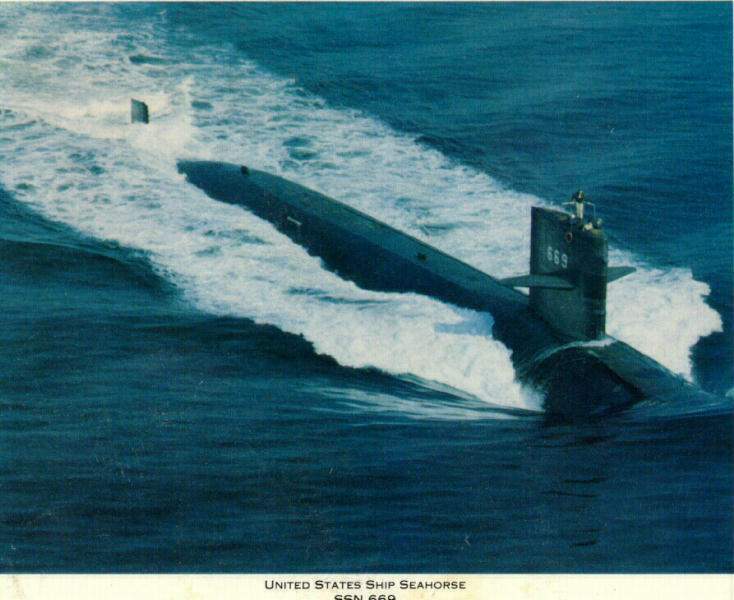 55k The Seahorse (SSN-669) underway, date unknown. Photo courtesy of Jack Treutle (of blessed memory). 46k Starboard side view of the Seahorse (SSN-669) underway, date unknown. Photo courtesy of Jack Treutle (of blessed memory). 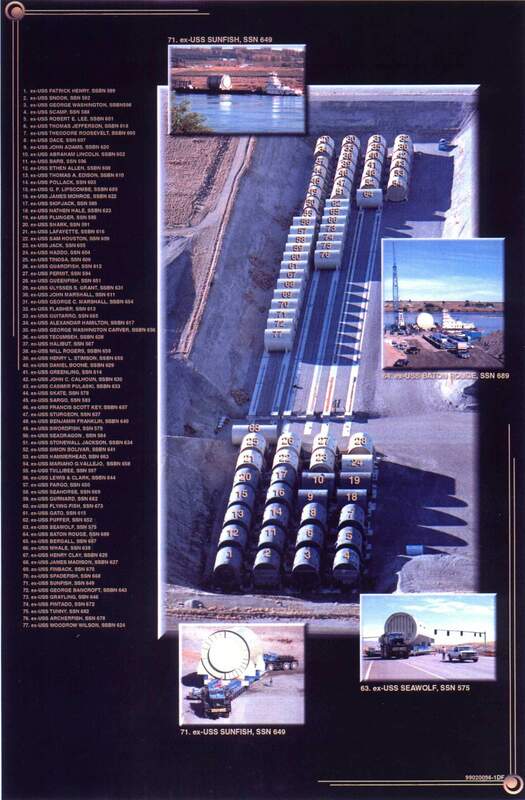 24k Commemorative post mark on the occasion of Seahorse's (SSN-669) decommissioning, 17 August 1995. Courtesy of Jack Treutle (of blessed memory).